Time does have a way of falling away from us . . . and so it goes that for nearly two years now I have been writing about the beasts that abide in our wildlife habitat. ‘A Bestiary . . . Tales from a Wildlife Garden’ is now featuring songbirds with warblers being the focus of my cursor. Warblers are truly delightful birds and come and go with the changing seasons . . . leaving us each late summer and fall only to return every spring . . . their departures and arrivals help us mark time . . . beginnings and endings of growing seasons. I would be honored if you clicked and scrolled over to Native Plants and Wildlife Gardens to see more images and learn a bit about these brilliantly marked birds. There are twenty-three installments in all but you can pick and choose which you might like to visit. Before the birds I did write about the mammals that roam around and about our twenty-one acres of forest, fields and gardens . . . not lions, tigers and bears but you can awaken bobcat, opossum and bears if you like. 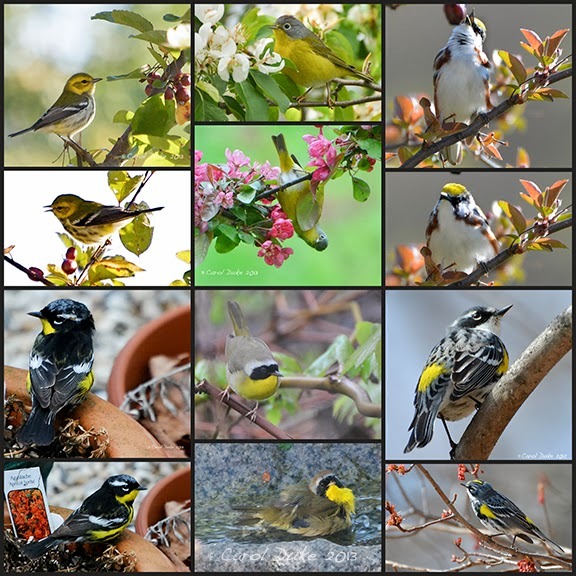 The labels below reveal the names of the six different warblers framed within this collage . . . perhaps you can match them up. Their little lives here at Flower Hill Farm so enrich my life and I do feel their absence both in the silence of songs and the stillness within the branches of trees and shrubberies. Revisiting our encounters through writing the Bestiary is a joyous way of recalling all of the remarkable wildlife I am so blessed to share this land with. There are more warblers, other songbirds then hummingbirds to write about before I move on to other beasties . . . like butterflies and bees.